During the last year I have been blessed with the opportunity to work with several of the most successful seminar agents in the country. Valuable information comes to me every day about essential elements for success in annuity seminar selling. I am happy to share with you what I have found to be the most effective tools available, to help you attain the highest levels of achievement in this extraordinary business. Let's say you and a friend are playing a game of coin flipping. You are calling heads and your friend is calling tails. When you flip the coin 50 times, odds are you are going to get heads 25 times. You will most likely win 25 times. Well, what do you have to do to win 50 times? It really is very simple, now get this, all you have to do is flip the coin 100 times! You will now win 50 times! You have just doubled the amount of wins! 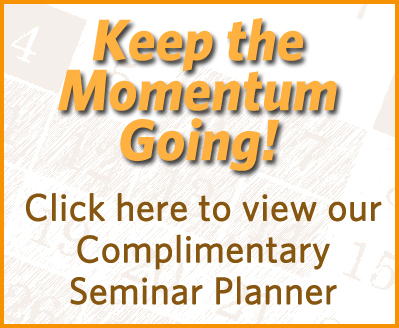 I talk with about 80 annuity seminar agents every week. Some of them are extremely successful, making well over $1 million a year in commissions. The distinguishing difference between these top producers and all the others, is their attitude. These very successful agents have set up their businesses so that they see so many people they don't care if someone attends their seminar and eats their food with no intention of making an appointment. They are not concernedwhen someone doesn't show up for an appointment, and it is no big deal if someone cancels a sale. After experiencing this shift to a confident attitude, their whole perspective, mode of operating, confidence, personality, and life are changed. How can this change in attitude affect your performance? You stop being a business "chaser". You become a business "magnet".You attract clients to you because they can sense that you don't "need" them. You naturally become more successful and you attract more success to you. You can become a magnet very easily. The first step is to set up your business so you are seeing so many people that you can barely handle the appointments. The best way to accomplish this is to use a very low-cost, simple and effective mailer, so that you can afford to send to as many people as you need, to double, or even triple your number of appointments. The top agents are getting 80% or more appointments at their seminars on a consistent basis.I won’t be able to give you all that you will need in this brief article to attain this level, but I can share a few vital points with you. The top agents are setting appointments at the seminar. In fact they set the appointments before they serve any food. The seminar must not be too detailed and the total focus must be on getting the appointment. Keeping it simple, and having a total system devoted to getting the appointment, is the common denominator of the most successful appointment setters. The people must like you. That is the most important thing that you must accomplish. They want to be entertained and impressed with your knowledge. The main thing is that they become comfortable with you personally. They will not set an appointment with you if they do not like you. 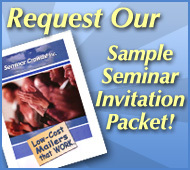 To set appointments, all you need is a simple form that your attendees fill out as you are going through your seminar. If they are writing down information and checking boxes on the form throughout your presentation, they will be much more likely to fill out the appointment time on the form when you instruct them to do this at the end of your presentation. Well-trained assistants will confirm appointments at the end of your presentation, while you are talking to those few people who have not scheduled an appointment. By the time you are ready to have the servers bring in the food, you will be reviewing your worksheets that should show about 80% or more appointment slots filled in! The phone call to your RSVP list is your first opportunity to develop a relationship with the client! It is very important that this phone call is made in the appropriate manner. Call them immediately upon receiving notification of their RSVP. 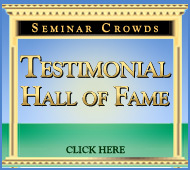 Thank them for responding, and let them know that these seminars are extremely popular. Explain that because of the number of people attending, the restaurant needs to have advance notice of their meal choice. Then describe the meal choices and get a confirmation from them of their choice of meal. Now that they have made a commitment for a meal choice, they are much more likely to attend. Follow up with a simple letter or card confirming their meal choice, and providing directions to the seminar location. Make a friendly reminder call the day before the seminar to make sure they know how to get to the restaurant. If you cannot get past the answering machine after several tries, leave a message. Say that you would appreciate it if they could call and confirm that they are coming, because these seminars are always full and there are people who would like their place if they cannot come. If you follow this procedure you should significantly lower your no-show rate. This is the most challenging part of the process for most agents. I know it was for me. Having the right system for you and your personality is absolutely critical. When I first started, I was using a one-call close. I am not suited for a one-call close and, even though I was closing, I was getting too many cancellations. It is imperative that you find the right system for you and learn it so well that you are absolutely confident when you are with the client. There are several closing systems out there and seminars that teach particular systems. I have talked to hundreds of agents who have purchased every system out there, and it is now clear to me which systems are the most effective for the largest number of agents. Extraordinary success in this business is attainable by almost anyone who is willing to apply themselves and use the techniques and systems that are working for thousands of agents all over the country. What kind of seminar to use, how to deliver the seminar, appointment setting strategy, and a selling system that works for you, are all essential components for maximum success. One thing that has become clear to me in 34 years of business and selling is that if you focus on your customer’s needs and achievements your own success will be assured. We have found that the key to our company’s growth has been total focus on helping our clients achieve great results! I will end this article with a great quote from one of my all time favorite philosophers.